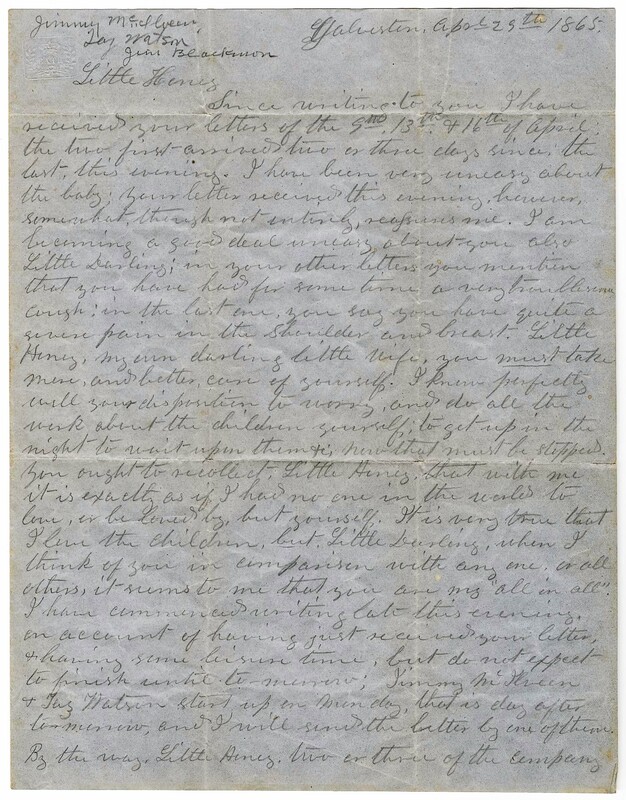 Letter from L. D. Bradley to Minnie Bradley, dated April 29, 1865 and sent from Galveston, in which he writes about his concern for her health, mentions the death of President Lincoln and his presumptions about its effect on the war. The contents of The Portal to Texas History (digital content including images, text, and sound and video recordings) are made publicly available by the collection-holding partners for use in research, teaching, and private study. The nature of historical archival and manuscript collections often makes it difficult to determine the copyright status of an item. Please contact the collection-holding partner for additional available information regarding copyright status of a particular digital image, text, or sound or video recording. By their use of these digital images, texts, audio, and video recordings, users agree to follow these conditions of use. •Responsibility for any use of these materials rests exclusively with the user. •Some materials in these collections may be protected by the U.S. Copyright Law (Title 17, U.S.C.). In addition, the reproduction of some materials may be restricted by terms of gift or purchase agreements, donor restrictions, privacy and publicity rights, licensing and trademarks. Transmission or reproduction of materials protected by copyright beyond that allowed by copyright law requires the written permission of the copyright owners. •When using an item from The Portal to Texas History, the Portal prefers that users give proper credit to the collection-owning partner and the Portal. The Portal's Citation Guide was influenced by the "Humanities Style" of the Chicago Manual of Style and by Evidence Explained by Elizabeth Shown Mills. Because the Portal is both a digital library and a preservation archive, three levels of identification are included in citations. ◦Identification of the original item; ◦Identification of an item's electronic format, its digital location (Persistent Link), the date the item was accessed, and the digital archive's name and location (URL); ◦Identification of the location of the original document. The Portal to Texas History and the holding repositories provide the digital resources and information as a service to aid users in determining the copyright status of an item. Ultimately, however, it is the user's responsibility to use an item according to the terms governing its use. The owning partner repositories are eager to hear from any copyright owners who are not properly identified so that appropriate information may be provided to researchers and teachers in the future.